I recently had the opportunity to create some custom nail polishes through Nayll.com. The brand has a range of polishes you can choose from, but the main idea behind Nayll is the ability to create your own custom nail polish. I’m a big supporter of indie brands and love to mix up my own polishes, but where I often get stuck is not having the ingredients that I want to put into just one bottle of polish for the idea I have in my head. That's where Nayll comes in. I’ve no plans of becoming a seller of my own PAWS polishes, and therefore I don’t want to purchase lots of ingredients that just wont get used. I think that is why I love this idea so much. I still get to create what I want, yet I don’t have to worry about buying all the ingredients. The process is very simple, although it's quite tricky coming up something that you think will work nicely together without seeing the colour combinations right there in front of you. You have to end up leaving some of the creativity with Nayll brand owner Sara, and she will mix your combination of ingredients into something that looks gorgeous. 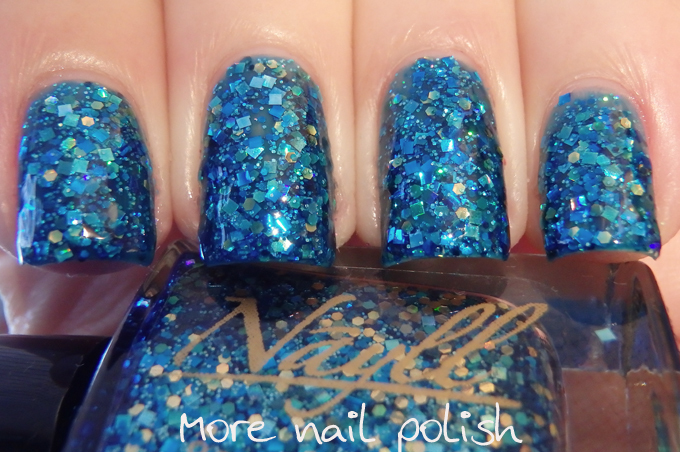 I chose to mix up five different glitter nail polishes, and themed them around my family. So let's look at what I selected and Nayll created. Bay of Tauron - named after my son Bayden, who is a Taurus. 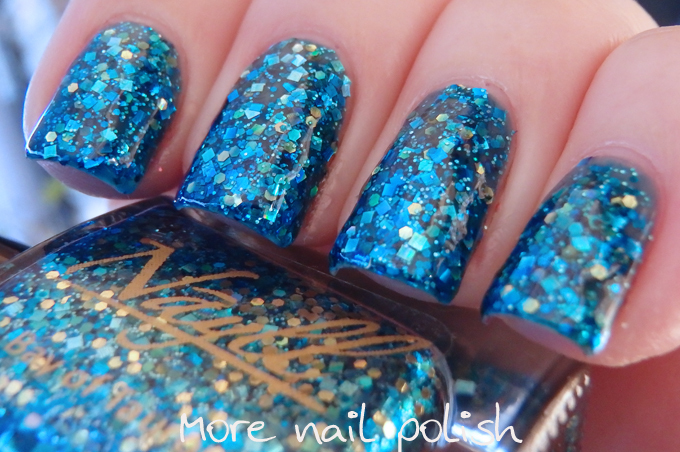 I started with a blue jelly base and selected lots of different shapes and sizes of blue, blue holo, aqua, aqua holo and gold glitters. This was jam packed with glitter and I got full coverage in two coats. Caprica sky - named after my daughter Skyla, who is a Capricorn. She also is a huge lover of pink and purple. 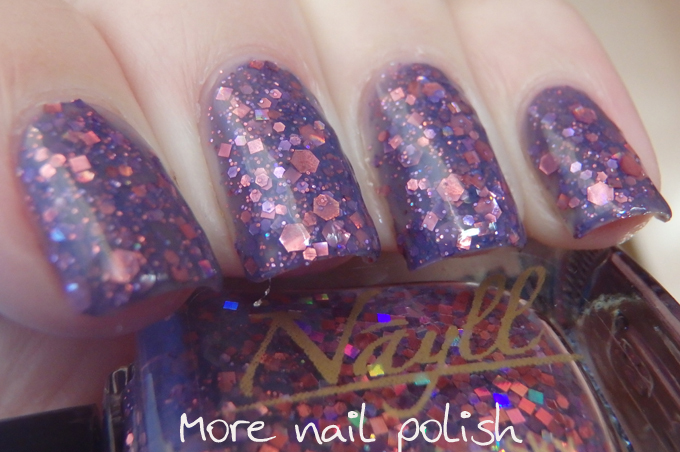 I chose the purple jelly base for this one and a selection of pink and purple and holo glitters. 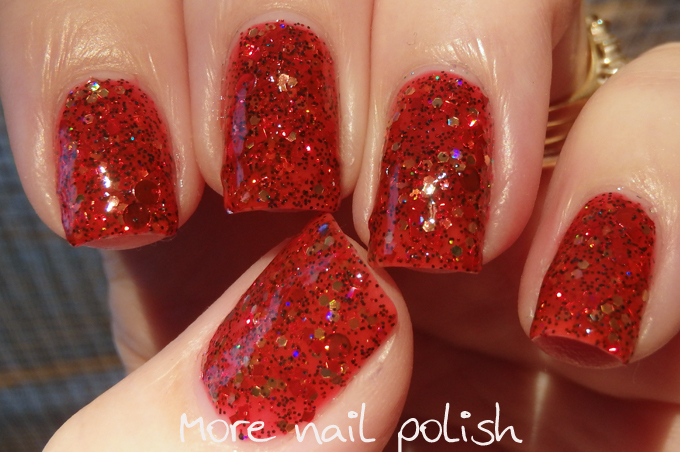 Once again, it was packed with glitter and full coverage was achieved in just two coats. Cat's chase shiny things - This one was for me, and it just had to be gold. 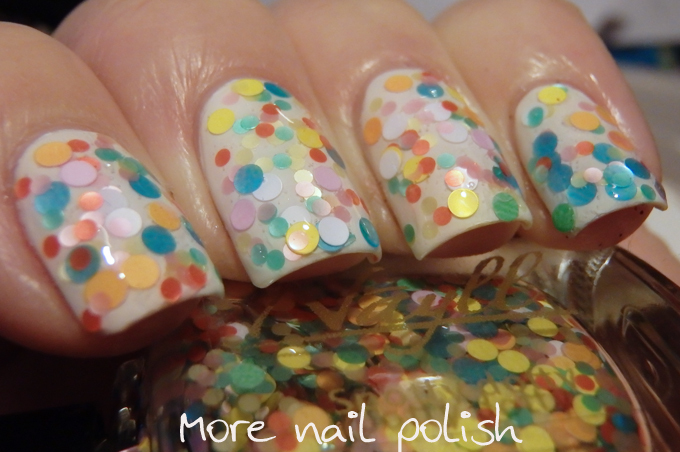 I chose the neutral jelly base and added a range of gold, silver and holo glitters to the mix. The slight crelly finish on this one makes the finish more milky, it's almost like a work appropriate gold glitter, but it's still so sparkly and golden. Open mike night - Named after my hubby. 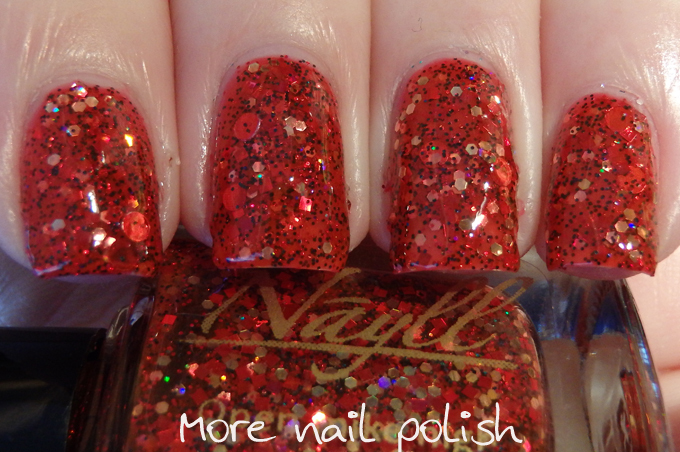 This has a red jelly base, red holo circle, red squares, gold holo hexes and black holo fine glitter. 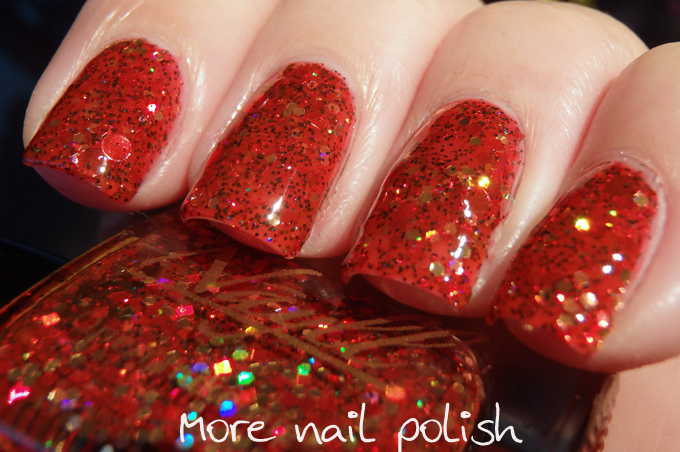 I imagined this one being darker, with a higher concentration of black holo glitter, but I really love the mix it ended up being, very glowy, although the red holo dots did make it a bit lumpy in some places. Spotty Dotty - named after my mum. 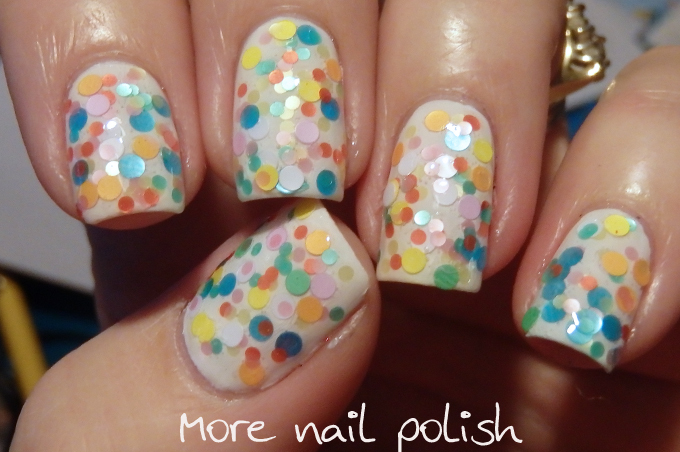 When I saw the selection of dot glitters to choose from, I knew I wanted to create a polish that was full of matte coloured dots. I chose a clear base for this one and layered just one coat over white. I love the look of this, it's almost like I went crazy with a dotting tool. My overall impressions of this concept is fantastic. 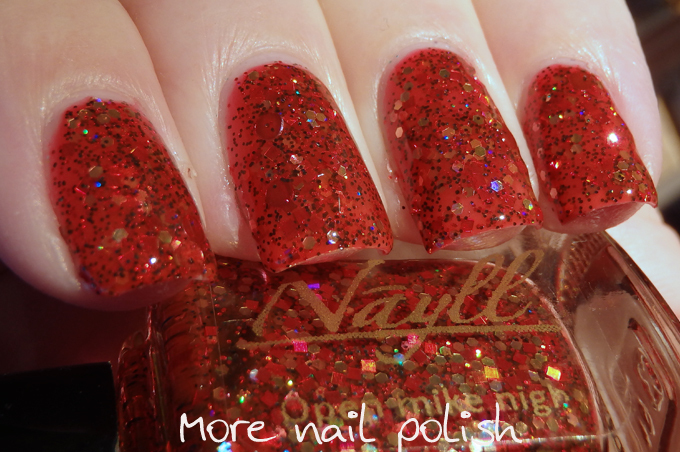 All the polishes I received were very close to what I had imagined them to be and they were all chock full of glitter, so they certainly don't skimp on the ingredients. 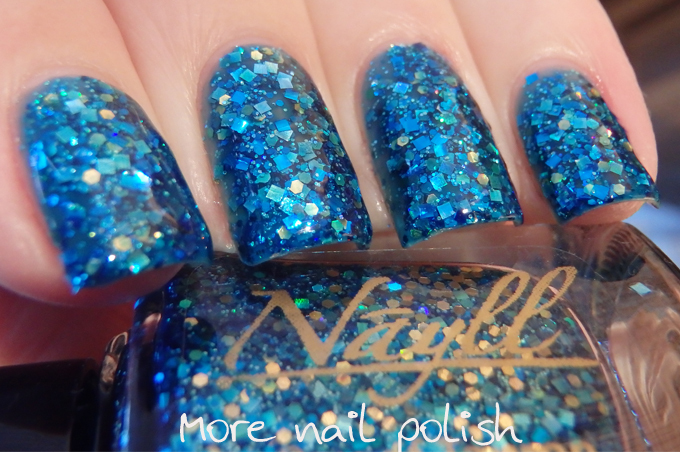 In my package from Nayll I also received a bottle of their Smooth It out top coat and their Holy Holo Top coat. 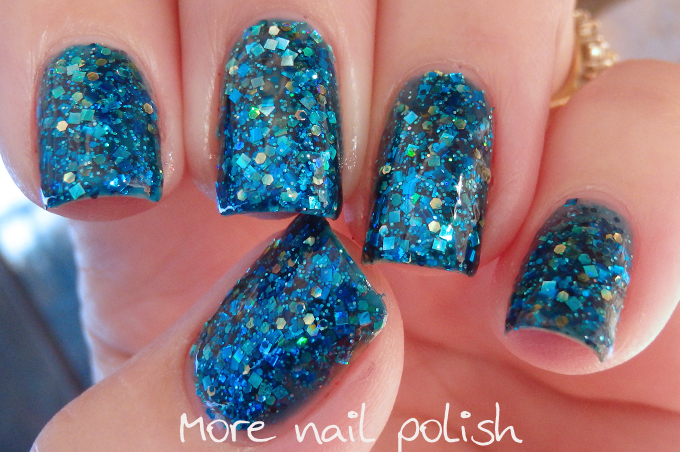 I used the Smooth it out top coat on top of all the above glitter manis, followed by a layer of Seche Vite. It did a good job and smoothing and leveling out the lumpy glitters. I'll share swatches of the Holy Holo top coat another time. The price of the glitter polishes start at $8 and increase up to $12 depending on how many different glitters you choose to put in. The shimmer polishes also start at $8, but the top price for those is $8.45 based on the three shimmer ingredient rule. 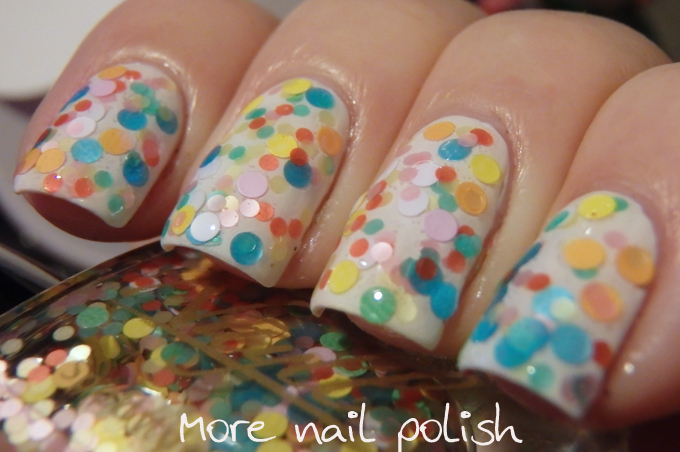 wow you made some awesome polishes! some I would buy if they were for sale! I love all the names and inspiration! Cat's Chase Shiny Things is so beautiful! What a wonderful concept! 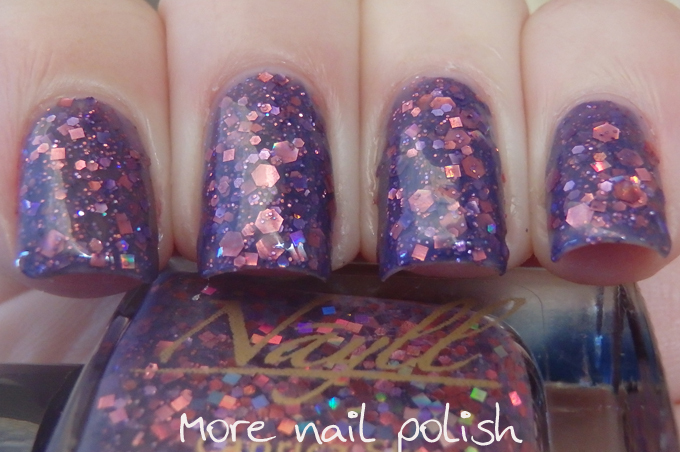 I love all the polishes you created and the names. Those would make very personal and unique gifts. wow! the blue one is so beautiful!